A SpaceX Falcon 9 rocket stands atop the launch pad ready to launch the DSCOVR space weather satellite from Cape Canaveral Air Force Station on Feb. 8, 2015. The launch was delayed to a ground radar malfunction. The spaceflight company SpaceX aborted the planned launch of a long-awaited space weather satellite on Sunday, as well as a novel rocket landing test, due to problems with a U.S. Air Force ground radar tracking system. A SpaceX Falcon 9 rocket was less than 3 minutes from launching the Deep Space Climate Observatory into the sunset sky above Cape Canaveral Air Force Station in Florida when the radar issue forced the delay. The next chance to launch the satellite, and attempt an ambitious Falcon 9 rocket landing test, will be on Monday (Feb. 9) if the radar issue can be fixed in time. Liftoff would occur at 6:07 p.m. EST (2307 GMT). "Air Force tracking radar went down. 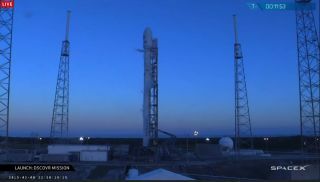 Launch postponed to same time tomorrow," SpaceX CEO Elon Musk wrote on Twitter after the delay. Musk added that the radar delay will allow SpaceX to replace a problematic video transmitter on the Falcon 9 booster's first stage. If SpaceX is able to proceed on Monday, you can watch the Falcon 9 launch live online beginning at 5 p.m. EST (2200 GMT), courtesy of NASA TV. John Insprucker, SpaceX's Falcon 9 product manager, said the Air Force's tracking radar is a vital safety system to make sure that rocket launches remain on course as they launch across its Eastern Range. Range safety officers use the radar to track rockets in flight in order to destroy the boosters if something goes wrong. "It is required for range safety for the flight of the Falcon 9," Insprucker said in a SpaceX webcast. The upcoming Falcon 9 rocket landing test will be SpaceX's second attempt this year to return a booster to Earth as part of the company's reusable rocket technology program. A Jan. 10 rocket landing attempt returned the Falcon 9 stage to SpaceX's autonomous spaceport drone ship, but crashed and exploded after running out of hydraulic fluid for its steering fins on the way down. SpaceX has loaded the Falcon 9 booster on this flight with more hydraulic fluid for the trip. Musk has also named the drone ship "Just Follow the Instructions" after the sentient colony ship dreamed up by science fiction author Iain M. Banks. SpaceX's Falcon 9 rockets are named for the Millennium Falcon of "Star Wars" lore. Former Vice President Al Gore speaks to reporters at NASA's Kennedy Space Center in Florida during the first launch attempt of the Deep Space Climate Observatory on Feb. 8, 2015, 17 years after Gore championed an earlier version of the mission called Triana. In 1998, then-Vice President Al Gore (who attended Sunday's launch try) championed the Triana satellite as a way to beam live, constant views of Earth from space for scientific study and educational uses. But by 2001, the mission was scrapped, and the fully built satellite mothballed and placed in storage. "Politics got in the way and the mission was canceled," Senator Bill Nelson (D-Florida) told reporters before launch in an ad hoc interview with Gore posted online by Spaceflight Now. "But fortunately some visionary folks from NASA and NOAA knew that this payload was so important that they kept it alive and in storage so that it could have additional instruments added to it." In 2009, the National Oceanic and Atmospheric Administration teamed with NASA to resurrect Triana as DSCOVR mission. On Sunday, Gore seemed to take the latest delay in stride. "DSCOVER launch delayed due to AF radar malfunction. May launch later this week," he wrote on Twitter. "After 17 years, that's nothing." Today, the satellite is designed primary to serve as a space weather early-warning system stationed about 1 million miles from Earth at Lagrange 1, a point in space directly between the Earth and sun. There, the satellite will be able to detect major solar storms that could interfere with aviation, navigation systems and power grids on Earth and give scientists up to a 60-minute lead on severe space weather events. The $340 million mission has a two-year primary lifespan, but could last up to five years depending on how much fuel it uses. Engineers test the solar arrays on the NOAA/NASA Deep Space Climate Observatory, a satellite designed to serve as an early warning system for solar storms launching in February 2015. The refrigerator-sized DSCOVR will join NASA's aging Advanced Composition Explorer satellite and the U.S.-European Solar and Heliospheric Observatory at the L1 position. Those older satellites also monitor the sun for space weather but are well past their prime, NASA and NOAA officials have said. DSCOVR can detect events a bit faster and serve as a backup to those aging satellites, according to Tom Berger, director of NOAA's Space Weather Prediction Center in Boulder, Colorado. DSCOVR also carries to Earth-watching instruments to study our home planet from space. One of those tools — the Enhanced Polychromatic Imaging Camera — will take photos of the sunlit Earth from L1 and beam them to Earth daily. The photos will be posted online for scientists and the public about 24 hours after they are taken, NASA officials have said. If SpaceX is unable to launch the DSCOVR satellite on Monday, two other opportunities are available on Tuesday and Wednesday, NASA spokesman Mike Curie said during launch commentary. Visit Space.com on Monday for complete coverage of SpaceX's DSCOVR launch and rocket landing attempt.